As well as asking our supporters to collect stamps we sometimes need specific items to be donated. These are usually sent, or delivered, to our Southern or Midlands Centres. Our Dog Welfare team need more toys (for the dogs of course!). Toys play a big part in the training of an assistance dog and we get through hundreds in a year. Whether it is for our puppy training classes, or for our dogs in advanced training, toys are important at Canine Partners. 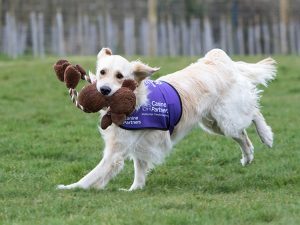 By donating a suitable dog toy, you will help save money, and that will enable us to train even more amazing assistance dogs. Please do not donate any tennis balls – thank you!